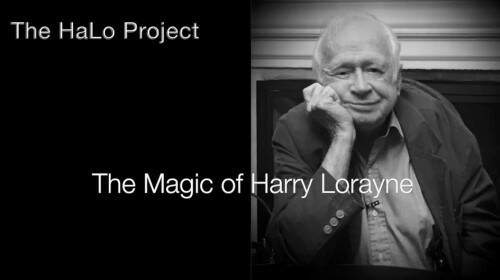 In July this year, there was an announcement of a new series of videos entitled The HaLo Project - The Magic of Harry Lorayne. Produced by Rudy Tinoco and The Magician's Forum, this project is a series of videos featuring rarities from Lorayne's card magic that he himself hasn't taught on any of his videos/DVDs. Harry Lorayne has a reputation as one of the top showmen of his time, and is highly regarded for his skill in teaching magic. He's also the author of several classic works on card magic, and there's a lot of gems that are buried in his books which haven't really hit the public eye or received the attention they deserve. Created with Harry Lorayne's kind permission and complete support, Rudy has engaged the assistance of several other magicians to perform and teach some of the hidden gems that can be found within the pages of Harry Lorayne's books, and have never been seen before on video. Some of the big names he's managed to conscript to this cause include Paul Gordon, Mike Powers, and even Michael Vincent. Volume 1 can be purchased via Lybrary.com for $10, and is a 50 minute video that shows and teaches five great tricks: "What Are the Odds? ", "Relationships Plus Royal", "The Sting", "Fourtitude", and "Easier 6-Card Royal". You can check out a detailed review (link) that I posted previously that covers all the effects included in that Volume. But now Volume 2 has been released and is available directly from Rudy Tinoco, and that's what this review is about. It is similar in length (50 minutes) to Volume 1, and includes the following five routines: "Color Gathering Plus", "The Indicator", "Sandwich Locator", "Four By Four", and "Royal Impossibility". This trick is performed to a spectator and then taught by Rudy Tinoco. It is from Harry Lorayne's book Jaw Droppers! (p.108), although the original idea for it was published in his Personal Collection and again in Classic Collection Vol 1, which are both out of print. Effect: This trick is introduced as an exercise of sleight of hand, luck, and magic, to accomplish a minor miracle. The Jacks are openly revealed and shuffled. The magician and a spectator each take and shuffle half of the deck. These are each cut so there are four piles, and a Jack is placed on each. By invisible sleight of hand, the Jacks are apparently moved to the top of the same pile; then by luck, the top cards of each pile are revealed to be Aces; and then by magic, the piles have arranged themselves as reds and blacks to match the Aces on each. Impressions: As you'd expect, this trick does require some set-up and can't be done impromptu. Several sleights are required, including Chris Kenner's 4 for 4 switch which Rudy teaches. The last part of this routine is all acting, and I like the ideas that Rudy shares about invisibly palming the Jacks to make them move to one pile, and how you can really draw out the three reveals as minor miracles created by apparent sleight of hand, luck, and magic - with the final `color gathering' reveal appropriately being the most impressive and surprising of them all, and perhaps even a magician fooler. This trick is performed and taught by Paul Gordon, who starts with a solo performance after introducing the background of the trick. This is the original version found in Harry Lorayne's 1967 book Deck-sterity (p.62). He later developed into some other tricks, but what Paul likes about the original - which he's been performing himself for decades - is that it can be taken in many directions. Effect: The deck is genuinely shuffled by a spectator, after which you remove an `indicator card' which is placed face down. The spectator selects a card (e.g. Two of Hearts) which is shuffled into the deck. You ask them to say the value, and when they say `two', you spell TWO, dealing three cards, revealing the top one to be a two - but not their card. Spelling OF reveals another two - but not their card. You ask them to say the suit, and when they say `hearts', you spell HEARTS, revealing the two of hearts as the final card. The indicator card is then revealed to be the final two. Impressions: This can be done impromptu and when selecting the indicator card you will be preparing for the next phase, so the value/suit of the cards used can be done differently each time, which is really quite clever. Unlike Harry's original, Paul uses a riffle force before going to the final self-working reveal phase of the trick. It's really quite an ingenious trick, and one of its real strengths is that it can be done impromptu - something that Harry Lorayne was especially fond of. This trick, which can be found in Reputation Makers and Classic Collection Vol 2 (p177), is performed and taught by Johnny New York; there's no separate performance but he explains the trick as he goes along. Effect: With two Jokers removed from the deck, a spectator's free selection is returned and shuffled into the deck. The deck is fanned, and the spectator selects any point in the fan into which the two Jokers are clearly inserted and upjogged - with it being made very clear that there is no card between them. When the deck is spread, amazingly there is a card between the Jokers - the spectator's selection. Impressions: Johnny introduces the effect by talking about how this is a suitable follow-up if your audience wants you to repeat a sandwich routine, and how it especially avoids one illogical aspect of most sandwich routines; of course it can also be done as an independent trick. I especially liked how Johnny teaches Marlo's Convincing Control, which involves a clever cull to control a spectator's selection from the middle of the deck while apparently leaving it in the middle of the deck. He also teaches the Lorayne Force (from Personal Secrets) which is key to making this effect work. It really is an ingenious way of accomplishing a sandwich invisibly and impossibly, using a method quite different from the more common way of doing this. It's also a great follow-up or kicker to an existing routine, given how quick it is. For this routine we go back to Rudy for the performance, while Johnny New York does the teaching. Four By Four is from Lorayne's Reputation Makers (p66) and The Classic Collection Vol 2. Effect: From a shuffled deck, four cards are randomly dealt to four spectators. They each select one - purely in their mind - and shuffle them before returning them to the magician. After a quick mix of the entire stack, the magician deals them out into four piles. One at a time, each spectator says which pile contains their card, and the magician is able to figure out what card they were merely thinking of! Impressions: This trick has quickly become one of Rudy Tinoco's personal favourites after he learned it from Johnny New York, who teaches it in this video with his own handling of Lorayne's original, while the performance to a group of spectators and some afterthoughts and commentary at the end is by Rudy himself. 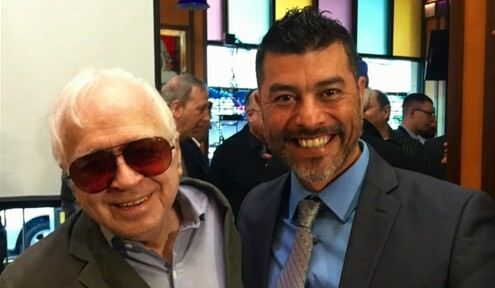 Rudy even says "personally this is the best card trick, arguably, that I have ever learned" - and I think that's a real reflection of the fun he's had performing it, and the amazement he's produced, even when performing it multiple times to the same spectators. As Rudy points out, the need to memorize four cards probably scares a lot of people away from this trick, but Johnny New York's handling involves a very easy way to do this. While this revised handling is harder to do impromptu, simplifying Harry's original method with help of a small stack cleverly eliminates the need for memorizing. I've also come up with an idea that simplifies the handling even further (see the secret forum thread for details). This trick can also be adjusted easily with more spectators (e.g. as five by five). When I first saw this routine performed, I thought it was basically a self-working trick, and pretty much was right about the main method used to accomplish this. It is essentially a self-worker, but there is some work you'll have to do in order to make it more convincing; Johnny also teaches both the Charlier Shuffle and Lorayne's Utility Mixer (from Jaw Droppers! Two) for false shuffling the packet which helps sell the effect. Much can be learned from Rudy's presentation here, and that really goes a long way to making this trick powerful. For the reveal, he uses patter along the lines that he's trying to determine from the cards in the pile which card he thinks that particular person would pick, and with a bit of acting, this can really sell the effect as a mind-reading or mentalism type routine. Emphasizing that the selected card was merely thought of also helps. Repetition can make a trick boring, but in this case it strengthens the illusion that you're really able to get inside your spectator's heads and know what choices they would make, and that really makes Four By Four a hidden gem. Rudy performs this for us to a group of spectators, and does the teaching. The idea has been done before by magicians like Michael Vincent, and this is Harry's handling, as found in his book Special Effects (p171). Effect: The five cards of a royal flush are separately inserted into different places in the deck. The deck is then cut into five apparently random packets - spectators are even involved in part of this process. Then the top card of each packet is revealed, and sure enough the impossible has happened: there are the royal flush cards! Impressions: This particular trick is one of the more difficult ones in the set, although anyone who has experience with breather crimps and faro shuffles should find it straight forward. For the final revelation, Rudy uses Harry Lorayne's HaLo Aces, so we also get to learn the HaLo Cut, and a very nice way to produce the cards on the top of the final two packets. Part of Rudy's performance didn't quite go according to plan, but he recovered well; there's even a lesson in this, as Rudy points out in his explanation, where he teaches Harry's Illogical DL as the "out" that rescues him. One particularly nice thing about this routine is that it's a natural follow-up to any routine that produces a royal flush; Rudy himself typically does it immediately after "That's Impossible", which will be part of Volume 3 of the HaLo Project. 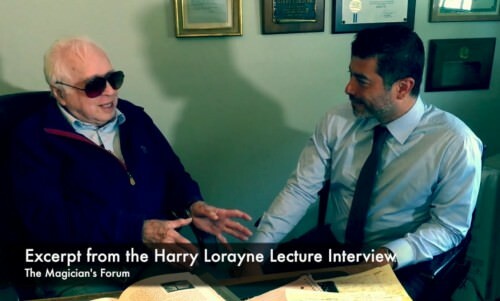 Interview excerpt: Following the final trick, there is another six minute excerpt from the interview Rudy did with Harry Lorayne as part of the 2016 Jaw Droppers Lecture, and features Harry sharing some stories about his early days in magic (a great story where he put himself into a pickle as a brash 18 year old, after agreeing to a challenge that he could perform something that Houdini did), and some of the challenges he's faced after losing his wife. I think that it is a lovely touch to include this, because it helps give some insights into what makes the man tick. Content: None of the tricks included here felt weak; I liked all of the choices. My favourites are probably the interactive mentalism of Four By Four, and the ingenious Sandwich Locator. Color Gathering Plus is also a very nice routine! I liked the format that is used in both Volume 1 and 2: for each trick, the presenter begins by introducing the effect and saying something about it, then there's the performance, then the explanation, and occasionally some afterthoughts. Video: The video quality is pretty good considering that professional recording equipment isn't used. Rudy's skills in video editing and overall formatting also help make this more professional, and he's included helpful annotations that help give added clarity, such as text bars showing the name of the trick. Teaching: The explanations are somewhat briefer than a lot of professionally released videos, but everything is covered just fine. It is geared primarily to those who can be expected to know the fundamentals of card magic. One bonus you get when purchasing this video is access to a special area over at The Magician’s Forum, where you can discuss the items contained in volume 1 and 2, for added tips and handlings. Sleights: I especially appreciated the fact that additional moves such as the Lorayne's HaLo Cut, Lorayne's Force, Lorayne's Utility Mixer, and Lorayne's Illogical DL are all explained as part of the instruction. I've read about these in his books, of course, but it's nice to see them performed and taught as part of the HaLo Project. It also means that you don't just get to learn some good tricks, but also some versatile utility moves and sleights. Series: This is the second volume of the HaLo Project series, and I believe that Volume 3 is currently being finalized. It remains to be seen how much longer the series will continue, but obviously Harry Lorayne has produced more than enough material to keep this project going for a good while! Cost: So, where do you get this, and how much does it cost? Volume 2 of the HaLo project costs $10, and you can purchase it by sending payment directly via PayPal to themagiciansforum@gmail.com, after which you receive a link to a password protected Vimeo page. From there you can watch it via streaming video or download the video onto your computer. Harry Lorayne has produced a massive amount of written work on card magic, much of which has never been performed or taught on video, and is often overlooked or relatively unknown. 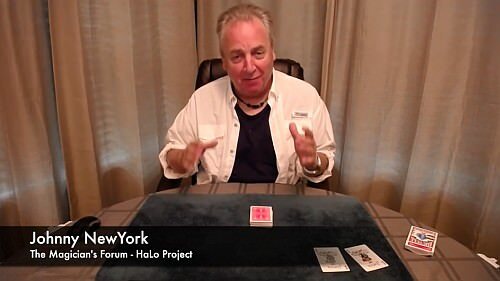 I'm grateful that Rudy Tinoco and others are stepping forward with the HaLo Project, to help bring these hidden gems to light, and at the same time ensure that Harry Lorayne's card magic will continue to be remembered and enjoyed. Granted, as good as the HaLo Project is, it's not quite that same without the master of showmanship, Mr Harry Lorayne himself, performing and teaching. But even without his own larger-than-life personality, the material of his books is strong enough to stand on its own. Given his advanced age, we can only be grateful that a team of enthusiasts have taken on this project, to help a new generation of magicians benefit from his magic, and keep the spirit of his card magic alive through his work. 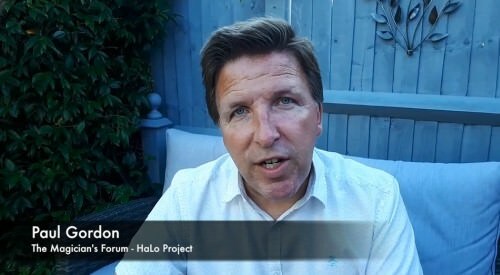 The HaLo Project is a fine project that ensures that Harry Lorayne's personal legacy is preserved, while at the same time digging up some great card magic for magicians around the world to enjoy and perform, and Volume 2 continues the solid effort that Volume 1 started this series out with. Talk about coincidence! After working on this review for a couple of days and just posting it a short while ago, I just checked my email and got a message from Rudy about Murphy's Magic distributing Volume 2 of the HaLo Project. That's great news! So it does appear that the distribution method for this is changing, and I don't know whether or not Volume 2 will continue to be available directly via Rudy and The Magician's Forum as it has been over the last few weeks. Maybe if you're quick you can still get this from him, but I'll leave it to Rudy to explain what all this means - no doubt he will post something on the forums here in due time. Great review (as always! ), Ender! !